Whats the first thing you see when you arrive to look a potentially "new" home? The roof! We like to say that we do not judge a book by its cover, but lets face it... 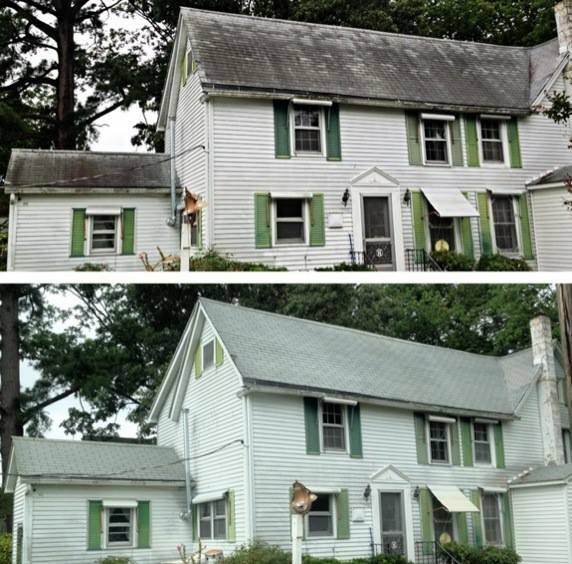 When you arrive to this home what would you think if the roof looked as it did in the top picture? "Well it looks like it needs a new roof, there is 10 thousand dollars that we don't want to spend. Not the case at all! A local company by the name of Kendall Roof and Exterior Cleaning has developed a solution that can be applied at a low pressure to your roof and thereby killing the mold by the roots. Which in turn leaves the roof looking like it should! This process takes less than a day and can really help the buyers in making that final decision. Working together with Resort Real-estate, Kendall Roof and Exterior cleaning is now cleaning every listing and sale that comes through as a gift to clients! Looking to purchase or sell your Berlin or Ocean City home today? Why not check out ocresortproperties.com and get a free house wash!